Holiday Clearance Sale!Now,Save 20% on All Gifts & Receive FREE SHIPPING On All Orders. Specializing The Best Quality & Cheapest Prices In Gifts,novelties,collectibles & Medieval Shopping Experiences On The Web.Gift Ideas For All Holidays & Occasions. 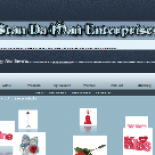 Stan Da Man Enterprises in Philadelphia is a company that specializes in Department Stores. Our records show it was established in Pennsylvania.